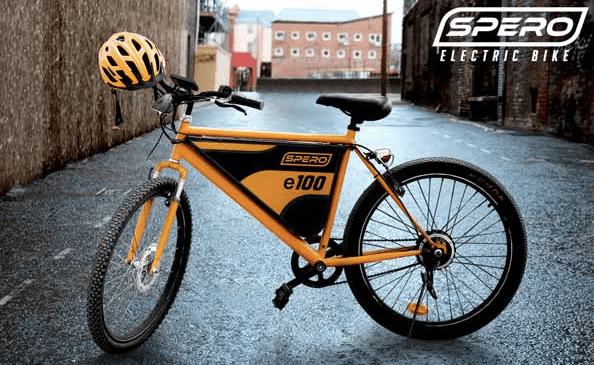 Spero E-Bike,funky electric bicycle takes the exertion out of riding a bicycle. It’s an urban commute vehicle, not only does it leave a zero carbon footprint, save you on big fuel costs, but will also ease the congestion on the roads in big cities. The Spero E-cycle was developed by Coimbatore-based Millitex Engineers S Manikandan, Supriya Paul and Mothilal. Spero comes in three models namely E30, E60 and E100 with a distance range of 30km, 60km and 100km respectively. The E-30 model is available in blue color, E-60 in blue and orange and the E-100 in blue, orange and black colors. All the three models of Spero are up for sale at special crowdfunding price. 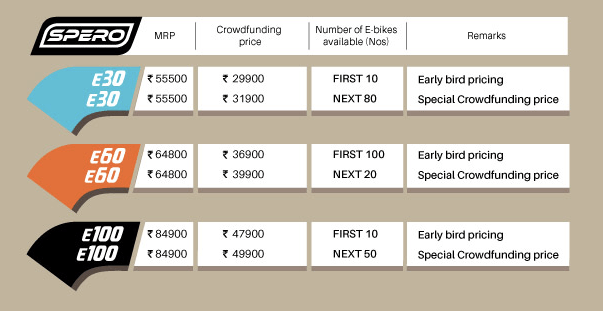 The original price of the E-30 is Rs 55,500, but its crowdfunding prices are Rs 29,900 and Rs 31,900. The E-100 model comes at Rs 84,900 and on the crowdfunding platform, it is priced at Rs 47,900 and Rs 49,900. The first campaign garnered Rs 38 lakh with over 100 bookings in India. The second campaign of Spero has started funding at fueladream and expected to raise 15 lakhs. The second round of crowdfunding will benefit those funders who will gain confidence from the success of the first,” S Manikandan, Managing Director of Milltex Engineers told Autocar India. The company is also planning to set up support centers in eight cities across India by March 2017. Spero is powered by a 48V lithium-ion battery, which has a one-year warranty offered by the company. The battery can can be charged from 20 percent to 80 percent in four to six hours. The battery weighs 2.7kg to 3.7kg depending on its model. It is positioned in the centre portion of the bicycle frame and is detachable. A regular 5-amp socket is required to charge the battery. Battery: 48V Li-ion battery with a 1-year warranty and charges from 20 to 80% in 6 hours. Charging: From a regular 5amp socket like your Smartphone! Spero also comes with a USB charger for smartphones, which is located just left to the battery and is an optional accessory. The E-cycle has a digital display which comes with password protection. 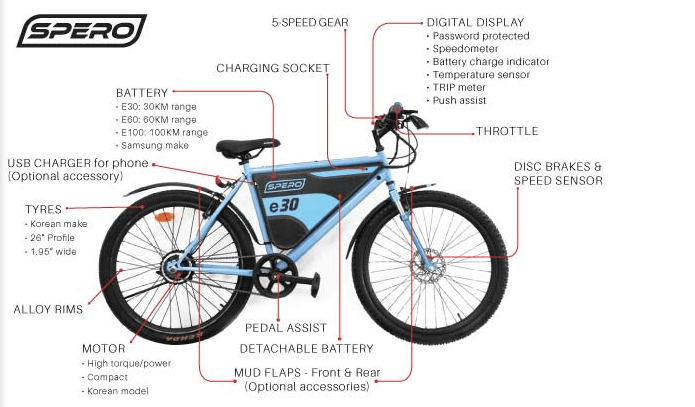 Other features of the bike include speedometer, battery charge indicator, temperature sensor, TRIP meter and Push assist. Spero’s other optional accessories include mud flaps in the front and rear end of the bike, headlights and carriers. The tires of Spero are Korean made and so is the 250W motor that the e-cycle runs on. Spero also features pedal assist and regeneration and cruise control as well. It comes with five speed digital gears in the electric mode. Images of bikes in all the colors are there on this campaign page. The team from Milltex will call you after your order to confirm your color preferences. Pricing of the company’s e-cycle starts at Rs 29,900, and the company is offering up to 40 percent discount on the bikes.